This is a current and comprehensive article not found anywhere else since April 2007, based on official documentation and 15 years of real-life experience from people who hold permits. Embassies/consulates, INFO expat guides and forums copied information from this post without permission and refuse to give credit/link or honor copyright, so you are not necessarily getting confirmation from different sources. Official websites rarely match reality, which is one reason I started Living in Greece. How can I get residence/residency in Greece? You must legally live or work in Greece full time. Can I write a letter requesting residence for five or 10 years? No, it doesn’t work that way. Read “How American/non-EU citizens can get a permit to live and work in Greece.” You must have compelling reasons to be here and earn that right. Can I get a residence permit for Greece before I arrive? No, because you must be inside the country and submit your papers in person. When does my work and/or residence permit for Greece expire? Look at your permit and read the expiration date. Will I get a notification to renew my work and/or residence permit? No. This is Greece; it’s your responsibility to keep track of your own affairs. Can I change jobs under my current work permit? Yes, if the initial/first year has passed. With regards to IKA, you need to take the new work contract and notify them of this change within eight (8) days of hiring. With regards to the work permit, you submit all of your paperwork with the new contract and work certification (ergoti bebaiosi) from your new employer at the time of its renewal. It is also possible to change jobs before the initial/first year has passed, but it requires permission and must be within the same industry in a similar position. I don’t recommend it, simply because it could unnecessarily endanger both your permit and your employment with an employer if permission is denied. I and many people I know have changed jobs successfully and had no problem, but the current administration is anti-immigration and unemployment is at an all-time high. Can I change fields or industry under my current work permit? Depends. You can submit the new contract and bebaiosi from your new employer at time of renewal with no problem at the municipality’s dimos or police station’s allodapon department. However, OAED (Manpower Employment) and/or the Ministry at a higher level has a right to decline renewal should they determine there are limited vacancies and sufficient Greek/EU candidates to perform this work. Authorities may ask you to provide evidence of a university degree (recognized by DOATAP, if foreign), significant experience or skills in this area of work. If you are classified as an “Υπάλληλος Γραφείου” (office worker), they may not care. Authorities may also request proof from your new employer that you are uniquely qualified, and (s)he could not otherwise find a Greek/EU citizen to fill the position. At this point, your new employer has the option to let you go should (s)he not want to provide documentation or fight to keep you and give them what they want. If the permit expires without being renewed for whatever reason, you must leave Greece and start from nothing again should you decide to come back and find another job. When should I renew my residence and/or work permit? At least 60 days in advance of your permit’s expiration, which is noted in nearly all of my articles. If you plan to be outside Greece for business or pleasure during the renewal period, renew earlier and tell them why if they try to turn you away. What if I still only have my bebaiosi (blue certificate with photo), the permit hasn’t been issued yet, and it’s time to renew it? You renew with your bebaiosi (blue certificate with photo). When does my bebaiosi expire? Look at the date your bebaiosi was issued and count one year from then. What if I don’t renew on time? You will be fined one-third the application fee or up to 300 euros if you renew anytime past the expiration date (also stated in this site’s articles), or you may be denied the opportunity to renew if you are not the spouse or child of a Greek or EU citizen. Sometimes you can get around it by hiring a lawyer or using connections, but be prepared to pay handsomely. I don’t recommend it. If I lose my job or can’t find another to renew my work permit, how long can I remain in Greece after the permit expires? According to Article 73 of the immigration law 3386/2005, there is no grace period. You are expected to leave Greece before the permit expires or you will be fined 600 euros for a period of 1-29 days past expiration and 1200 euros for 30 or more days past the permit’s expiration. If you have a long-term EU-wide permit issued in Greece, you are given up to six (6) months from the date of expiration to leave the country. How do I renew my Greek permit? Using same procedure as when you got it the first time, but normally with fewer papers. What if I don’t remember? If the appropriate article is not available on this site, call or visit the municipality “dimos” office or grafeio allodapon and find out. If you live in a smaller town or an island, the local police will have an allodapon or foreigner division. Be proactive, pay attention and take some notes. That’s how this site was created — I paid attention and then used my free time to write it out for everyone. What if I changed my status since the last time I renewed? You still need to go to the same office, tell them your change of status, and they’ll tell you what documents you now need. If the article is available on this website, you can prepare in advance. If not, people have been doing it the other way for years. It’s common sense. Can I apply online for a Greek work/residence permit? No, because they want to see you in person and examine that all of your documents are originals. If you’re not in the Greece, you cannot apply. Does part-time work qualify me for a work permit? *Immigrants wishing to change their professional status from salaried employee to self-employed must wait a minimum of three (3) years. Plus self-employed immigrants must keep their same business for two (2) years before being allowed to change their line or scope of work. Can I pay my own IKA? Yes, but you are only allowed to purchase up to 20 percent of required 200 ensima* of IKA for the year. The other 80 percent must be earned through an employer or acquired by paying your own OAEE (TEBE/TEVE). *For some categories of permits and renewals, only 120 ensima are required per year. If I get engaged to a Greek, do I get a permit to stay in Greece? No. That’s already covered in “How non-EU citizens move, live and work in Greece.” Fiance(e)s are treated the same as single people. There are no fiance(e) visas and permits. I married a Greek citizen, do I need a residence and work permit? If you are a non-EU citizen without dual citizenship with the EU, yes. Only EU citizens have the right to live and work in Greece without a permit; all non-EU citizens need a permit. Marriage does not grant you special privileges or the right to break the law, nor does it guarantee you will be issued a residence/work permit if a committee decides against it. If you are a non-Greek EU citizen, you do not need authorization to work in Greece, but you will need a residence certificate/permit under certain circumstances after 90 days residence in Greece. If I marry a Greek, do I get citizenship so I don’t need a permit? There is no such thing as marrying a Greek for citizenship. Marriage only lowers the residency requirement if you have a child together. You must have several years legal residence in Greece, prove fluency in the Greek language, pay 700 euros and wait several years to go through the naturalization process. See “Greek citizenship by naturalization” for details. But yes, if you obtain Greek citizenship or citizenship from another EU country, you would no longer need a permit. When will my permit sticker or card be ready? Authorities and municipalities claim that it should only take 60-90 days or up to six (6) months, but there is no set time. If you are the spouse or child of a Greek/EU citizen, there is a law that says permits will be issued sooner than 90 days. In reality, this is not guaranteed since you and your spouse must first attend and pass an interview at the Perifeira, but the process is significantly expedited in comparison to non-EU citizens not connected to Greek/EU citizen. Most people wait from 7-8 months to 18 months. In 15 years, I’ve consistently waited up to a year and past the expiration date. The quickest I’ve been issued a Greek permit is six (6) months, and it happened only once. In May 2010, there was a backlog of 600,000 people waiting for their residence/work permits to be issued, and further delays were announced in 2011 when the government announced a reshuffling of municipal staff. Since then, processing has been slower, not faster, especially between November 2011 to June 2012 when Greece had five different governments in 7 months. If you received it within 60-90 days, be grateful not boastful. The majority do not. Is there anything I can do to speed up the processing of my permit? Will they notify me when it’s ready? Some municipalities will call you; most do not. It’s your responsibility to check status. No. Few municipalities have their own websites. Of those that do, there is no facility to check status online. This is a VERY advanced concept in Greece. Half of public servants don’t know how to type or use a computer. How do I check the status of my Greek work/residence permit? In person. Inquiring by phone seldom gets results, as most often you will be told they cannot give out information without verifying your identity and you must stop by in person. What if there’s a problem with my sticker/card? Since it is your responsibility to check on your permit, they should be giving you a status. If there is an issue, the ministry will send the letter to the municipality’s “dimos” or police station’s allodapon department; it is rare that you will be personally notified by phone or letter. If there is a letter, it usually arrives late at your home, and you have no recourse because it was your job to check on the permit in person. Once I have my permit, is everything OK? The municipality or ministry has the right to review and revoke permits for any reason at any time, unless you hold the long-term EU-wide residence/work permit issued by Greece. Does Greece grant permits to gay/lesbian non-EU partners of Greek/EU citizens? No. It doesn’t matter if you were married in another country or not. Only man-woman partnerships are recognized. This violates an EU directive that says all EU member states must not discriminate based on $exual orientation, but an EU High Court will need to intervene and Greece will delay it as long as possible. To illustrate my point: Greece only started granting long-term EU-wide permits to people who earned that right in 2008, even though this directive was passed by the EU in 2003 and in effect since December 2005. I’m a male of Greek origin over 18, but I do not have Greek citizenship. Can I get a residence/work permit as the non-EU spouse of my Greek/EU wife? No. The residence/work permit granted to non-EU spouses and children (under 21) of Greek/EU citizens is only for pure non-EU citizens of no Greek origin. Because you are of Greek origin and have the inherent right to claim citizenship, which entitles you to work/reside in Greece and the entire EU. This is a privilege. If you’re a male between the age of 19-45, Greek authorities know you’re trying to avoid mandatory military obligations by going this route, and it does not tolerate draft dodgers. The residence/work permit application asks the birthplace of your parents, the Greek tax office/eforia/DOY will look through its register, and the Ministry of Citizen Protection and Ministry of Interior will examine your application and delve into your background. It doesn’t matter if you are registered in the οικογενειακή μερίδα/oikogeneiaki merida or hold a Greek passport or Greek ID or not. You are breaking the law. If you’re a female of Greek origin, there is no reason why you shouldn’t stake a claim to citizenship at any age. Should you apply for Greek citizenship and be denied, this may be grounds to apply for a Greek permit. What about my son who is under 18 and technically a non-EU citizen? All males of Greek origin or descent between the age of 19 to 45 will at some point be drafted into the army should they reside permanently — more than 185 days a year — in Greece or wish to work here, regardless of birthplace, current citizenship, domicile or registration in the οικογενειακή μερίδα/oikogeneiaki merida, or possession of ‘permanent resident abroad’ status. Read, “Mandatory military obligations for Greece.” It will only change if the law changes. How can I get a green card for Greece? ‘Green card’ is a term used by the United States to describe permanent resident status acquired by a non-American citizen, and does not apply outside its borders. Greece had a prasina karta about 10 years ago, but they disappeared as fast as they appeared. In 2008, Greece started issuing permit cards, but they are not called green cards and different colors apply to different categories. If I get a divorce, can I keep my permit? Spouses of Greek, EU or non-EU citizens who already passed the interview and hold a permit can retain it after a divorce if the marriage lasted three (3) years OR if there is solid evidence of domestic abuse no matter how long the marriage lasted. However, after a renewal of one year, he/she must secure a residence/work permit based on another reason such as work or funds from outside Greece. See “Residence-work permits” to see some available options. The only exception is if you hold a permanent 10-year permit card, which you may keep without meeting new requirements as long as you do not stay outside Greece for more than two (2) continuous years. If my Greek/EU partner passes away, can I keep my permit? Yes, if you held the permit and resided in Greece for a minimum of (1) one full year. Is my Greek permit transferable? — Transferable to another person. No. — Transferable to another job; I already answered this question above. — Transferable to another country. Yes, but only if you have the special long-term EU-wide permit. Otherwise, the answer is no; you must start from nothing in the new EU country. The Ministry of Interior announced in October 2013 that a new Immigration Code (Κώδικα Μετανάστευσης) 4151/2013 may grant EU-wide status but only to certain categories of long-term residents. This has not been passed by Parliament or published into law as of last update. What kind of work and/or residence permit do I qualify for in Greece? c) inquire at the municipality “dimos” office, grafeia allodapon or police station’s allodapon department, if in Greece. What are the addresses and phone numbers of the municipality’s “dimos” offices and police stations’ allodapon departments in Greece? How do I call ‘1500’ from outside Greece? If you’re outside Greece, you shouldn’t be calling these numbers. You should be calling the Greek consulate/embassy nearest you. Is there a Greek government website (.gr or .gov), where I can find information on residence/work permits? — A new guide for immigrants in Greece funded by the EU is publishing info from November 2010, but the information is inaccurate. — KEP Citizen Service Centers are primarily for Greek citizens and staff rarely know anything about non-Greek citizen issues, often dispensing incorrect info. KEP and Ermis websites are poorly written and incomplete. — City of Athens website is populated with information from KEP and inaccurate. — Greek consulates/embassies have limited information on their websites and are often not current on new laws and/or dispense varying levels of accurate information. — “Official” Greek government ministry websites are poorly translated (if at all), rarely updated and use jargon that many don’t understand. Some have reused my articles without permission. My website contains information not available anywhere else, is updated on a regular basis and balanced with first-hand information and reader feedback, not just research and translations from Greek to English. The majority of official Greek governmental, consular and expat guides and forums did not exist and/or were not disseminating information on any of the subjects I cover until after I started my website. Many have plagiarized information from me, so you are not getting confirmation from different sources. Be careful who you trust. Thanks for the information, this is really helpful. A friend of mine had said this to me a few months ago as well, and as I usually get things corroborated by at least three people in this country, I’ll faithfully count you as the second one! Hi – Just wanted to introduce myself and thank you for a very interesting and useful site. My wife was born in the US of Greek parents and then she grew up in Athens from age 12 to 18. Her sister stayed in Greece, married and had children. I met my wife while she was attending college in the US and broke up the family by marrying her. Now that we are about to retire, we have some desire to live in Greece part of each year. We are considering getting her Greek citizenship if it makes the whole residence permit process easier for me. The ironic thing is the number of friends and relatives in Greece that don’t understand that we can’t just stay in Greece as long as we want. They truly have no clue about the 90 day rule. Her sister only recently acquired Greek citizenship based on marriage to a Greek and having children. So she never went to the effort to get birth and marriage records for their parents. I will continue to follow your site for information and amusement. Thanks again! Hi Darrell, thank you for your kind words and sharing your story. Indeed, it will be a lot easier for you to acquire a residence permit and stay without having to prove financial means from outside Greece if your wife claims citizenship. Because she is of Greek origin, she will bypass several requirements — language fluency, 3-12 years residence in the country, knowledge of culture/history, character examination, several years processing time, 1600 euro fee — all things someone like me would need to have. Marrying a Greek and having children changes the naturalization process very little (it only lowers the number of years residence from 12 to 3 years) and is a much, much harder way to go. Your sister-in-law would have had a much easier time getting birth certificates, marriage records and filling out an application to get citizenship since that is her right. Oh well! Other countries are more lenient about allowing well-to-do foreigners reside in their country illegally because they benefit financially, which is one of many reasons Americans are unaware of legalities. Greece is not one of those countries. Hi S, this is a known problem. Municipality employees are supposed to be well-informed of current laws and then tell someone up front if they don’t have the proper qualifications to get a permit. However, many employees are ignorant or knowingly accept documents/applications/money from someone they know will be refused, so Greece can keep their money; the last figure I heard was 300.000 people waiting for permits that might never come. I provide information for everyone so they can educate themselves and understand if they truly qualify for a permit BEFORE going to authorities who might cheat them. From the years I did not get my permit — either because they lost my file or issued my permit only after it was expired — I’ve only managed to get a refund one time, and this is because I had a Greek friend complain/yell/swear a lot at the Mayor’s office. The mayor bought us drinks to stop my friend from yelling, then he made a call to both the eforia and dimos office to let them know to stop hassling us and refund the money. Before that, the eforia said to go to the dimos office, and they said to go to the Mayor, and they said to go to the eforia, and they said…well, you get the idea. Hedi, you need to consult with the municipality’s dimos office regarding your special situation. I am not an employee of the Greek government or a lawyer, and you need to speak directly to them. Your website has been super helpful on working and living in Greece, I wish I would have found it a month ago and saved some headaches! I just have one confusion about work permits Greece for non-EU, non-Greek backgrounds (I’m American) – wondering if I enter Greece on a tourist visa, can I apply for and attain a work visa/permit (assuming I am sponsored by an employer and get a job) without leaving the country? There was something I read about having to apply for the permit in your country of residence? And if I have to leave the country, is there a certain amount of time I have to be gone? Thank you so much for all the info on this site, much appreciated! You could have found answers easily by looking at the first link offered in this article, which is also listed in the side column for American and non-EU citizens. Per my Questions policy, please use the search and categories options, or redundant questions will be deleted next time. Thank you and good luck. I am a non EU citizen, I have my own business in my country,I wish to have a Greek Passport, SO I can then be able to give my children the Greek Passport,what is the best way to have the Passport. Thank you for your time,I appreciate. Not everyone is eligible for a Greek passport. To find out if your qualify, go to the post “Greek Passport” and read it carefully. Good luck. I have been going back and forth to the municipality to apply for a residence permit. I have almost finished processing the medical and other stuffs theye needed, now they asked for a medical booklet which will take almost 3-4 months according to the company which they applied for me. They have given me the blue permit bebaiosi, and said i will get my sticker(residence permit) after submitting my health booklet which i have to wait. I wanted to know now since my 90 days is coming ahead, is the bebaiosi good enough to represent my stay here while waiting for my proper residence permit and health booklet? Am I gonna be sent home? Your bebaiosi is not a permit. It is also your responsibility to get your medical booklet and check on your permit at the municipality office. The answer to your question is in this article and many others. Your question is already answered above, please take another look. I am married to a Greek citiazen. I have work permit now as an employee in Greece. Now I want to renew my residence, How do I apply now, Is it any difference than last time. Your question is already answered above. Please take a look. i got my blue paper with photo on it, how long it takes to wait for the sticker? i’m married here in greece to a greek citizen. It’s called a bebaiosi, and I’ve already answered this question in the above article. Makes no difference to whom you are married. i’m a non EU citizen and my wife is greek. We have 2 kids. we were married in South Africa in 2003. we move for good to greece in december 2008. We stayed first in thessaloniki at my wife mother house as she was waiting for her affectation job. (she is a teacher). 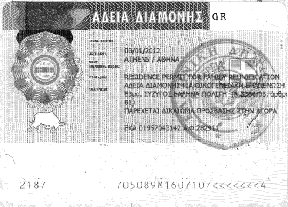 On the 7 january i apply in thessaloniki for my greek residence permit. And in the meantime my wife was affected in Athens. so we relocate to Athens. Every 7 of the following months i kept on calling thessaloniki for a follow up on my residence with no news. In the late july, i had a call from them asking me for an additional paper (that i gave them actually in january, but disappeared somehow). i travel to thessaloniki to give it to them thinking that i was going to get my residence permit soon. Nothing happens since then, and early october i call once more. they were asking why i apply in thessaloniki while i live in Athens. After repeating myself once more, they say its ok, and i have to wait. Just today my wife call again, and she told me that the person who have to take care of my residence is on vacation. Please Kat, do you think that is it possible and it really make sense or there is something that i missed? I have to travel for business, i cant do anything anymore for almost a year. As it says in the article above, permits can be issued even after their expiration. There’s nothing you can do to speed it along. By law, spouses of Greek citizens are supposed to receive their permits more quickly, but I found this to be true in less than 50 percent of cases. That’s how it is. Please be aware that you and your wife still need to attend an interview (required of all non-EU spouses of Greek citizens) before your permit is issued, which is explained in “How non-EU citizens can live/work in Greece.” A letter containing a mandatory appointment date/time will be sent to whatever address you gave them, which I assume is your wife’s mother’s house in Thessaloniki. I am the American wife of a British/EU citizen, so I believe we could both go to live in Greece as retirees based on my husband’s status. However, assuming we decided to live there permanenty, what would happen in the future when my husband, who is 8 years older than me, dies? Would I be able to stay in Greece or be forced to leave? I suspect that if we lived there permanently and I applied for and was granted a Greek residency permit, that I would be able to continue living there after my husband’s death. Am I right? Thank you for your help. Your question is already answered in this article. Please take a look. Note: Comments are now closed to due people not paying attention. I will only allow new, relevant or complicated questions at my discretion. We got our residence permit sticker just after 30 days since we applied. After reading all these stories it was miracle for me. Not just that it arrived in 30 days, the municipality guy called my number and informed that our permits have arrived. So maybe we were lucky and everything went just fine. On May 5, Greek newspaper Kathimerini reported that 600,000 residence permits were backlogged due to staff shortages. So any of three things is possible: a) you got lucky, as you said; b) you were dealing with staff and a municipality that has it together and cares; or c) it may have helped that you had accurate information from this website, which expedited the process since everything was in order.